Safflower is an annual plant; its glabrous, branching stem grows from 1-3 feet high and bears alternate, sessile, oblong, or ovate-lanceolate, dark-green, shiny, leaves armed with small spiny teeth. The orange-yellow flowers grow in flower heads made up of clusters of green bracts, topped by tufts of deep yellow florets, turning orange as they mature; about 1 to 1 1/2 inches across. It is a short lived plant. Grows in poor, dry soil, in full sun. Unrelated to saffron, but the dried and powdered orange-red florets are used as a saffron substitute. Native to the Mediterranean countries and cultivated in Europe and the United States. Some herbs are cultivated on a surprisingly large scale. 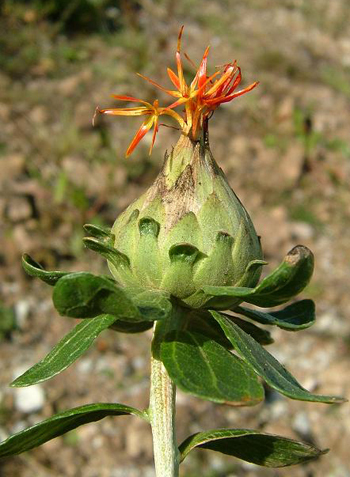 In southern California, vast fields of safflower are the basis for the safflower oil industry. Used by the Chinese in candle making. Safflower used as a coloring for white wines. Color is similar to the very expensive saffron. 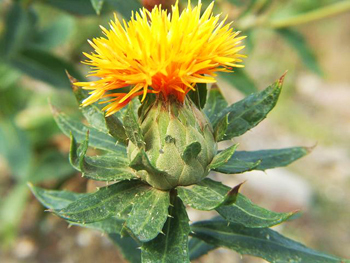 Taken hot, safflower tea produces strong perspiration and has thus been used for fevers, colds, and related ailments. 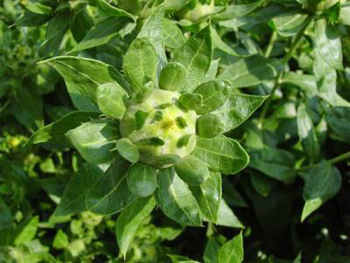 It has also been used at times for its soothing effect in cases of hysteria, such as that associated with chlorosis. Used for delayed menses, poor blood circulation, bruises, injuries (used in liniments), and measles. The flowers can be dried and powdered to make a saffron substitute; mixed with finely powdered talc, they make a rouge. Fresh flower petals yield dye colors ranging from yellows to reds. Flowers are used as a scent in potpourris and look nice dried in flower arrangements. Infusion: steep 1 tsp. flowers in 1 cup water. Take 1 to 2 cups a day. Tincture: a dose is from 20-60 drops.